Attitude: Very caring, kind and helpful. Curious. A little rebellious. Not very calm at stressful times. Talents/Powers: Regular abilities that come with being a child of Aphrodite, pretty fast runner. Weapon: Small eyeliner stick with a pink cap that turns into a sword when the cap is off. Flaws: Not too good with spears, scared of total darkness. Likes: Clothes, fresh air, water, plants, music, love, books. Dislikes: Stuck-up people, monsters, bad people, total darkness. Life Before Camp: She lived with her dad and was always cared for. One day she was walking to the bus stop when a Fury jumps at her out of no where. Thinking fast, she side-stepped away from it's strikes. She looked through her purse to find something to get rid of the frightening creature. She sees an odd, shiny object at the bottom. She pulls it out, eying the Fury to side-step it's strikes again, then examines the object. It would of looked to be an ordinary eyeliner but it was colored gold, with Greek inscriptions craved into it. She quickly uncapped the pink lid. It turned into a beautiful sword, right before her eyes. She stopped, blinked in confusion then swung the sword as the Fury pounced onto her, dissolving it into yellow dust. Disgusted, she went home to tell her father. 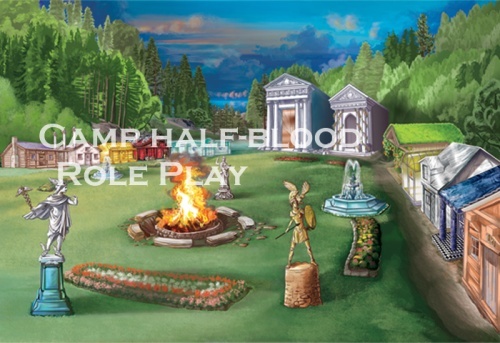 He explained everything to her and drove her to Camp Half-Blood.